Water Cooling radiators & other related components not included. 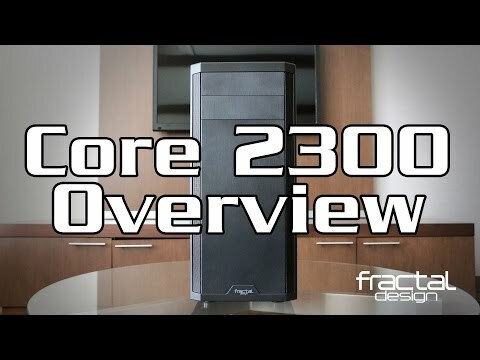 Fractal Design Core 2300 Black Mid Tower Performance Case with USB 3.0 & 2x 120mm Fans w/o PSU is rated 4.5 out of 5 by 12. Rated 4 out of 5 by LeeWorezGaming from It's a slick and professional design. Well I was in dire need of a case due to my motherboard and my heat-sink for my processor not fitting inside my current case at the time so I looked throughout Amazon and Scan and I saw that this one was just perfect for what I was looking for due to the back panel had more space for my heat-sink mount. Rated 5 out of 5 by Lou65 from Solid,good value case Prior to a problem free build,one foot was omitted upon receipt of the goods. One brief phone call to Scan and two days later a package containing four feet arrived from Fractal. Plenty of room to work with in a case that offers a fair few options cooling wise which is pleasing given the price. Recommended. Rated 5 out of 5 by Highball3875 from Good case Solid, well assembled case, no sharp edges inside either of the two I purchased. Easy to work inside, plenty of room for my components. A few months down the line, no problems have been encountered. Rated 5 out of 5 by Lucky81 from Very nicely made Very nicely made. Really impressed with Fractal and will likely only buy / recommend Fractal from now on. Rated 5 out of 5 by Testercles from great What a great product for the price. I did not expect this level of quality from a case at this price range. All it needs is more fans as it has the space for several, but I suppose the flexibility is there since some would want to go watercooling instead. I bought a similarly priced Case several years ago and was happy with that. I tried this one out without reading reviews and was gladly surprised. Rated 5 out of 5 by TrekkieStu from Excellent budget case Bought this case to fit a larger graphics card and have to say I'm very impressed with it. No hard drive bays means more room for long cards. All hdd's attach to a vertical strip which you insert once your build is complete making hardware insertion and cable tidying a lot easier. Nice finish on the front of the case too. Fans are whisper quiet which is a bonus. Only minor point, the hdd light is REALLY bright, but you don't have to connect it if it bothers you. Will Coolermaster Seidon 240V Version 3 All In One AIO Hydro Cooler fit in this case?